Buying your new home can be an exciting adventure! Our home buying guide will help you understand the process – from steps you should take at the beginning through closing on your new home. While there are a lot of details involved, taking the right steps and making informed decisions will make your purchase go smoothly as possible. Before beginning your home search, make sure to have clearly set goals: desired neighborhoods, type of home, must-have amenities, etc. 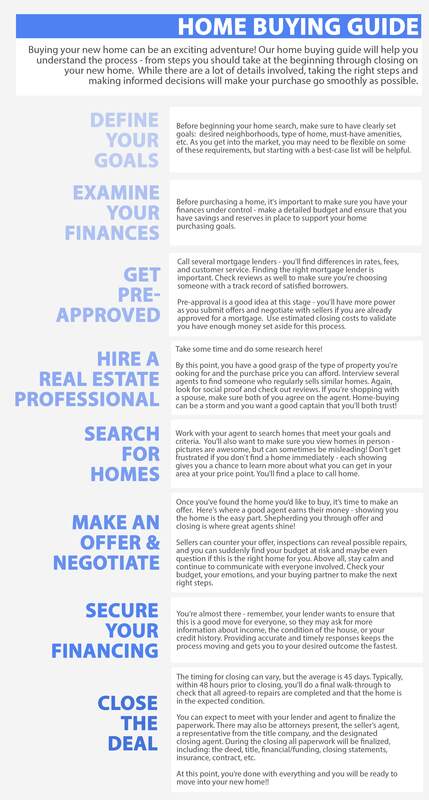 As you get into the market, you may need to be flexible on some of these requirements, but starting with a best-case list will be helpful. Before purchasing a home, it’s important to make sure you have your finances under control – make a detailed budget and ensure that you have savings and reserves in place to support your home purchasing goals. Call several mortgage lenders – you’ll find differences in rates, fees, and customer service. Finding the right mortgage lender is important. Check reviews as well to make sure you’re choosing someone with a track record of satisfied borrowers. Pre-approval is a good idea at this stage – you’ll have more power as you submit offers and negotiate with sellers if you are already approved for a mortgage. Use estimated closing costs to validate you have enough money set aside for this process. Take some time to do some research here! By this point, you have a good grasp of the type of property you’re looking for and the purchase price you can afford. Interview several agents to find someone who regularly sells similar homes. Again, look for social proof and check out reviews. If you’re shopping with a spouse, make sure both of you agree on the agent. Home-buying can be a storm and you want a good captain that you’ll both trust! Work with your agent to search homes that meet your goals and criteria. You’ll also want to make sure you view homes in person – pictures are awesome, but can sometimes be misleading! Don’t get frustrated if you don’t find a home immediately – each showing gives you a chance to learn more about what you can get in your area at your price point. You’ll find a place to call home. Once you’ve found the home you’d like to buy, it’s time to make an offer. 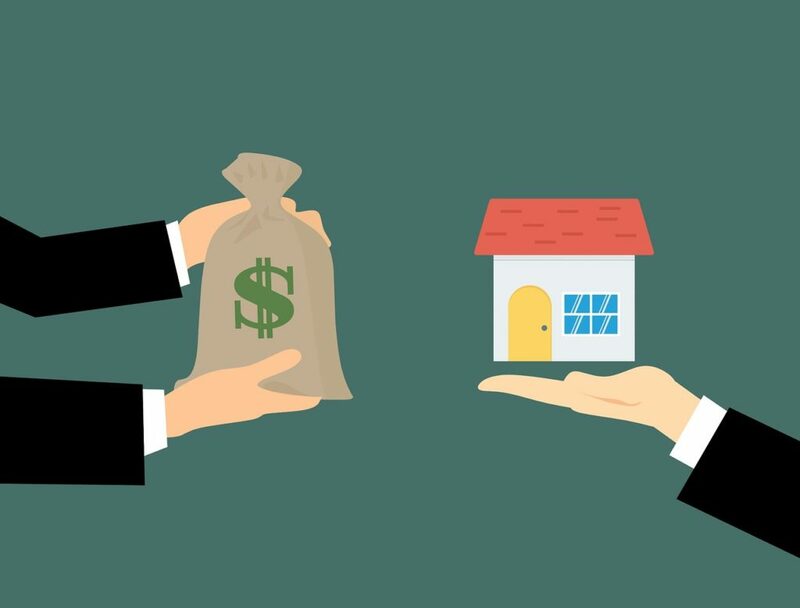 Here’s where a good agent earns their money – showing you the home is the easy part. Shepherding you through offer and closing is where great agents shine! Sellers can counter your offer, inspections can reveal possible repairs, and you can suddenly find your budget at risk and maybe even question if this is the right home for you. Above all, stay calm and continue to communicate with everyone involved. Check your budget, your emotions, and your buying partner to make the next right steps. You’re almost there – remember, your lender wants to ensure that this is a good move for everyone, so they may ask for more information about income, the condition of the house, or your credit history. Providing accurate and timely responses keeps the process moving and gets you to your desired outcome the fastest. The timing for closing can vary, but the average is 45 days. Typically, within 48 hours prior to closing, you’ll do a final walk-through to check that all agreed-to repairs are completed and that the home is in the expected condition. You can expect to meet with your lender and agent to finalize the paperwork. There may also be attorneys present, the seller’s agent, a representative from the title company, and the designated closing agent. During the closing all paperwork will be finalized, including: the deed, title, financial/funding, closing statements, insurance, contract, etc. At this point, you’re done with everything and you will be ready to move into your new home!! Let's Schedule A Time To Talk! © Copyright 2019 Roots Real Estate. All Rights Reserved. Legal Disclaimer: Information deemed reliable but not guaranteed. Selling in 2019? Get A FREE Home Valuation!